John Lennon's first non-Beatles single, the anthemic Give Peace A Chance, was released on this day in the United Kingdom. It was recorded on the penultimate day of his and Yoko Ono's second bed-in for peace, in room 1742 of the Queen Elizabeth Hotel in Montreal, Canada. Give Peace A Chance was co-credited to Paul McCartney, although he played no part in its creation. It was partly by way of thanks for his help in recording The Ballad Of John And Yoko in April 1969. In later years, however, Lennon alone received a compositional credit. I didn't write it with Paul; but again, out of guilt, we always had that thing that our names would go on songs even if we didn't write them. It was never a legal deal between Paul and me, just an agreement when we were fifteen or sixteen to put both our names on our songs. I'd put his name on Give Peace A Chance though he had nothing to do with it. It was a silly thing to do, actually. It should have been Lennon-Ono. 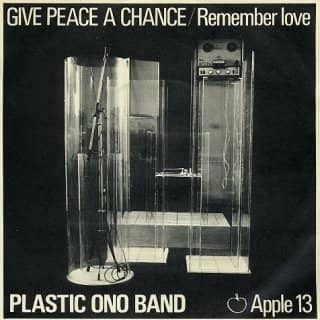 The single was released as Apple 13. It peaked at number two on the singles chart, being held off the top by The Rolling Stones' Honky Tonk Women. Give Peace A Chance was released in the US on 7 July 1969 as Apple 1809. Its highest chart placing on the Billboard Hot 100 was number 14.